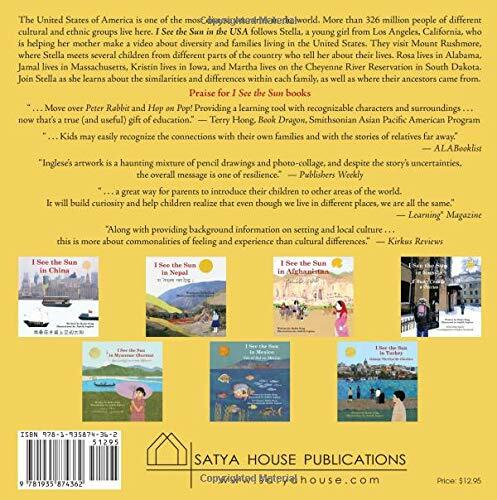 I See the Sun in the USA (Satya House Publications, October 22, 2018) is the newest in the award-winning, critically-acclaimed “I See the Sun” children’s book series. This latest book uniquely brings children into the social and interracial realities of this country. The United States of America is one of the most diverse countries in the world. More than 323 million people of different faiths, cultural, and ethnic groups live here. I See the Sun in the USA follows Stella, a young girl from Los Angeles, who is helping her mother make a video about diversity and families living in the United States. They visit Mount Rushmore, a National Park in South Dakota, where Stella meets several children from different parts of the country. 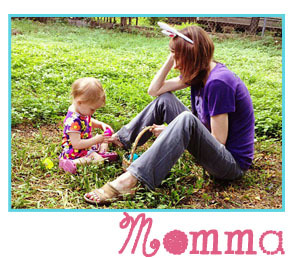 They each tell her about their lives and Stella imagines what their days are like. Geared to children age five and up, parents, elementary school teachers and librarians, the book serves as a unifying force for children in a divided country. It points out differences and similarities between American children with unique cultural backgrounds with an overarching emphasis on those elements which bind us together as a country and welcome our diversity. 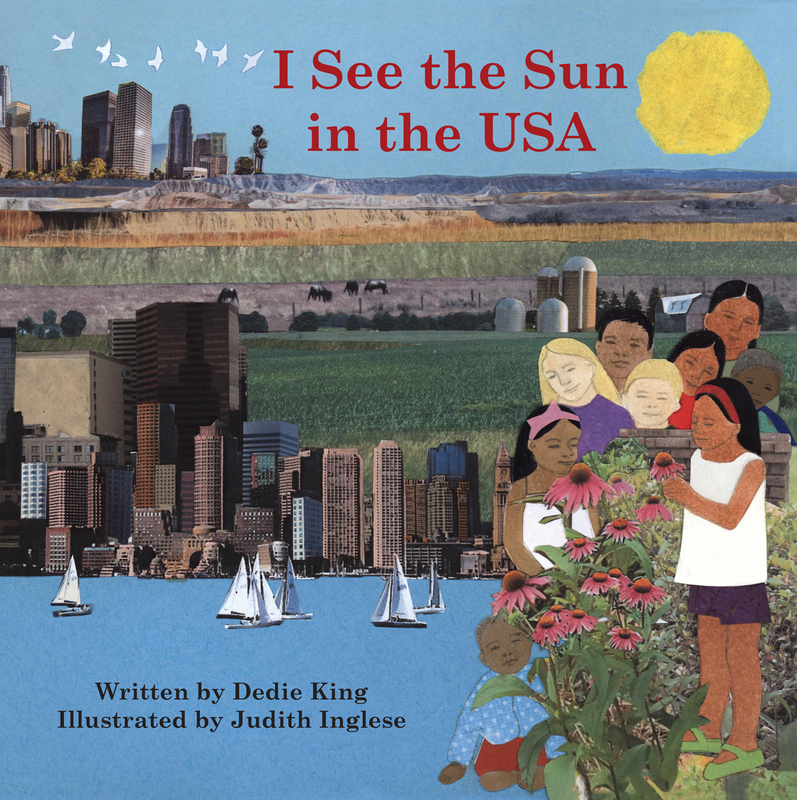 I See the Sun in the USA tells the story of Stella and the children and families she meets, with a variety of ethnicities and cultures, while on a family vacation. Each child is also presented by a family tree depicting the blending of their families, hence the blending of American culture. Glorious illustrations express and enhance the story line. Readers will learn about similarities and differences with each family depicted in the book. Rosa lives in Alabama; Jamal lives in Massachusetts; Kristin lives in Iowa; Martha is a Lakota Indian and lives on the Cheyenne River Reservation in South Dakota. Each child describes a typical day in their life to Stella and is supported by colorful collage illustrations. An illustrated family tree is also provided that offers some insight into where these families each originated. About the Author: Author, Dedie King, a Peace Corps volunteer in Nepal, also taught school there. She travels extensively and spends a considerable amount of time, not as a tourist, but immersed in many cultures, living with families who open their homes to her. She holds a MEd and has taught elementary school and children with learning disabilities. Her interest in writing books about different cultures is to bring awareness to young children of both the sameness and the differences of cultures around the world. About the Illustrator: For more than thirty years, Judith Inglese has been designing and fabricating ceramic tile murals for public environments. She has been commissioned to create ceramic murals for all manner of public spaces, including libraries, the National Zoo, elementary and high schools, pediatric and adult healthcare facilities, senior centers, town centers and nonprofit organizations. She is the illustrator of the award-winning “I See the Sun in…” series of multi-cultural children’s books. www.iseethesunbooks.com.